Serinus Energy, an international oil company with assets in Ukraine, on the field "North Makeyevka" for the first time in the Lugansk region has found oil deposits. it took 54 days, and its depth has reached 2,426 meters. This is the third well in this field. 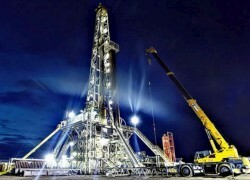 "For the first time in Ukraine, the company received a positive test for the presence of oil. During the tests, received 0.5 cu. meters of oil density at 37 ° valuation technique API (American Petroleum Institute) », — the company said. The company noted that the results do not yet allow drilling to determine the hydrocarbon reserves in the category of commercial production. Finally, this can be said after further analysis. Recall that Kulczyk Oil Ventures, which in June merged with Winstar Resources Ltd and changed its name to Serinus Energy, began drilling a third well at the "North Makeyevka" at the beginning of June. Help Serinus Energy, which operates in Ukraine through the firm "Kub-Gas", owns the license for the development of the "North Maeevskogo" field until January 2017. In the assets of the company in Ukraine also has 4 more gas-condensate area, concentrated in the Dnieper-Donets Basin: Olgovskoe, Makeyevka, Krutogorovskaya and Vergunskoe field.